It’s that time of year again when we are all getting into the Christmas spirit. Decorating our homes, buying presents, and visiting with family and friends. One of my favorite things to receive at holiday time are all the great Christmas cards with pictures of friends and family. I love seeing all the family pictures and feel terrible just throwing them in a pile after all the effort that went into making the cards. So, I came up with some DIY Christmas Card Display ideas. It’s a fun DIY Christmas craft your whole family will enjoy creating. These are so cute they could even be part of your Christmas decorations. Follow along with me as I show you how to make simple clothespins into festive Christmas Card Displays. To create these Christmas clips, all you need are a few items. The clips I am using are wooden clothespins you can buy at the dollar store. Next, you will need a can of spray paint in whatever color you like – I chose red for this project. You will also need a large ribbon or string to hang the clothespins and cards on. Lastly, you will need a box or two for the spray painting. Don’t have time to run to the store and find all of these items? I added links below of the products I use on Amazon. One less thing to run out and do during Holiday time. Decide how many clips you want to use to hang up your pictures. You can put more than one holiday card on a clip so keep that in mind when deciding on your number of clips. Next find a box you won’t mind getting paint on. I picked one up at Costco but any card board box you have will work. Clip the wooden clothespins to the edge of the box, then get your spray paint ready. If you don’t want the floor to get paint make sure to throw down an old sheet, towel or box before spraying. I just did it out in the yard and the grass was fine. Now, begin spraying the front, backs, and sides of the clothespins. Remember to add something underneath the box to save your floor. Once the clothespins are dry, you can clip them to a string along a banister or on a large ribbon on the wall. To make my display look a little bit more like Christmas decorations I wrapped pine garland around my banister and hid the string I clipped the cards too. You could also skip the string and just clip you card directly to the garland depending on how you hang the garland. This would also look great hanging over a fireplace mantel with the cards and garland cascading down. The garland I used was pre-strung with lights so it looked great at night with pretty glow. Here is an example of the garland I used to complete this Christmas card display. 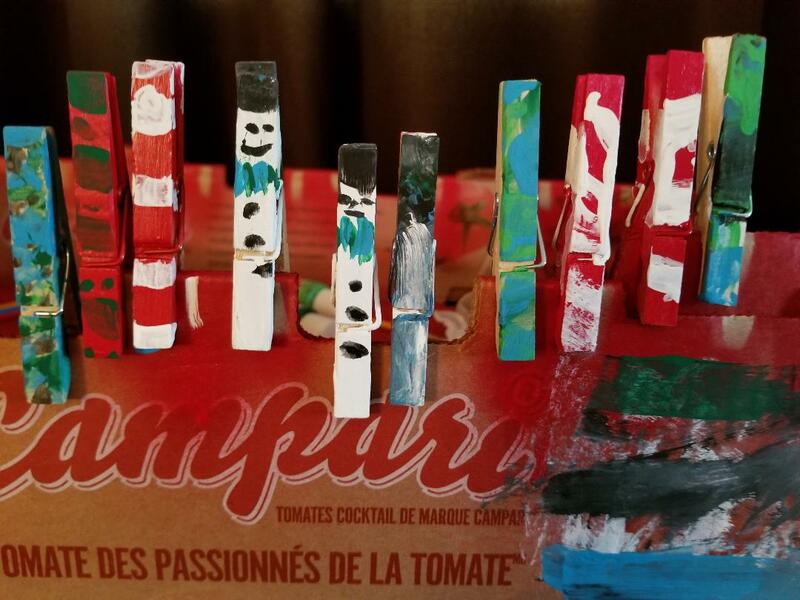 My kids wanted to paint the clothespins too. So, I let them use their imagination and paint a few. It was pretty easy to make a snowman by just painting it white and adding some black dots. Candy canes were also easy just spray paint the clip red and paint white stripes. This was a fun addition to the project I hadn’t anticipated. It definitely made it more of a fun family project. The kids love showing everyone that comes over which clips they made. I hope you will enjoy making this DIY Christmas Card display your own. Let us know in the comments any other great ideas you have for displaying Christmas Card or any questions. Have a wonderful Christmas Season!